Bonswa everyone! It has been a busy day here. It started with breakfast at the guest house. There was delicious mango that was (as with most of the food) grown right here on the compound. After thinking the kitchen staff, we drove to the deaf camp to take a census of the residents. In order to take the census more quickly we split into two teams, each had one person who could interpret for the deaf and one person who could interpret for Creole. The Deaf camp has made considerable improvement over the last time we sent a team. They now have what are called “T-houses” – T for temporary. 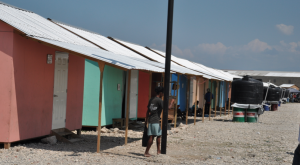 The houses are made of plywood and have tin roofs but have no bathrooms or water of any kind. They do have porches which is where they spend most of their free time. The Census was mainly to find out if the community was interested in relocating and overwhelmingly they responded in the positive. During this time I walked around with my HVX200 video camera and a D90 still camera. I was surprised that everyone who saw me smiled – many beckoned me over to take their picture. I was shocked by how interested they were in being photographed. This reminded me of of some interesting charities I heard about at Catalyst last year that take photos of people in marginalized communities so that those people can have a photo of themselves and their family. So I’m contemplating a photography mission trip in the near future. While the situation was much better than it was last time (largely thanks to the IFRC who built the T-houses) it is far from what most americans would consider livable. They have to walk to another part of the camp to take a shower, they have to walk even further to use the toilet. Parts of the camp have very tall grass still, which means misquotes and malaria. Robin Pass, who was worried at first that she would have trouble communicating with the deaf, served as one of our interpreters. 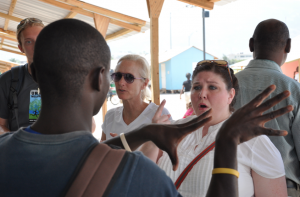 She was surprised to find out that the deaf here in Haiti are very similar to those in Alabama. Possibly the biggest difference is that when they sign they are mouthing Creole. Robin and Tara speak english while they sign. Both Tara and Robin say that the Haitians do sign with a Creole “accent” while Robin signs with a southern “accent” and Tara signs with a New York “accent.” It made me wonder if there are any deaf people who do impersonations of each other. In the afternoon we took a drive around down town Port Au Prince. things. We took a picture of our entire team including Tara, Ronald and Margaret from 410 Bridge and several of the kids at St. Vincent’s. The young man in the wheel chair told Robin that his parents abandoned him because he was deaf and lame and therefore ‘useless.’ Robin wouldn’t let him go until he finally said “I now understand that I am important.” He and all the kids at the school really enjoyed having their pictures taken. We continued through Port Au Prince where we continued to see more devastation. 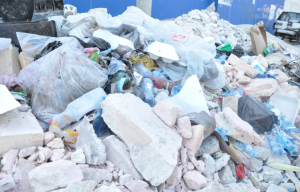 These piles of rubble are everywhere throughout the city – combined with trash and (sorry if this is too graphic) even human waste. Perhaps the greatest indicator of the condition of the country was what they call the palace. This is their White House and in the wake of the disaster it looks like a strong wind could blow it over. Could you imagine our white house looking like this? The dome is cracked and fallen forward. It looks like a scene from the movie Independence Day after the aliens have attacked. Could you imagine living in a country that couldn’t organize enough to repair it’s president’s house? When we finally got back and had dinner we met with a woman named Georgia who is part German part Haitian. She works with the deaf community. This was very helpful in learning about all the players in the situation. 410 Bridge – the mission organization with which we’ve partnered. Most well known for their work in Africa, they specialize in building self-suffecient communities based off of micro-enterprising. 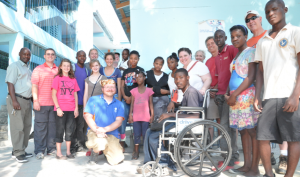 Frazer – Us, the church that wants to preach the gospel, educate and build church for the people in the deaf community as well as answer any medical needs they have and assist in their becoming independent. The IFRC – International Federation of the Red Cross (not the same as the American Red Cross) this group oversees the land that the camp is on – they want to move in blind and paraplegic Haitians. Other smaller players – We’ve run into a few other smaller groups that also want to get involved in way way or another – not all of them are looking to collaborate in their efforts. So the short version is – we need prayer to be sure that all entities can come together to help this community as best we can.